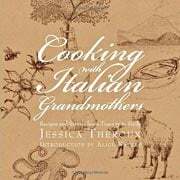 The only teensy peeve we could possibly imagine having with the charming Jessica Theroux and her sticky, chewy, squidgy-in-a-good-way tomatoes? The nonchalant mention that they make an able accompaniment to “many dishes.” We can certainly come up with our own list of uses–tossed with pasta, plopped alongside grilled meat or fish, smooshed onto ricotta-slathered crostini, stirred into stews, and gobbled greedily, one after another, as you stand at the counter–yet we’re curious to hear what those Italian grandmothers that Theroux spent a year interviewing suggest. We know that at least one of them harnesses sticky tomatoes in a frittata, as Theroux shares a lovely recipe for a jumble of eggs, pecorino, and these very tomatoes in her lavishly photographed book. But if anyone has any other suggestions, we and our stash of sticky tomatoes are standing by…. 1. Preheat the oven to 325°F (162°C). Line a baking sheet with parchment paper. 2. Slice the cherry tomatoes in half and the larger tomatoes into slices 1/3- to 1/2-inch thick. Place the tomatoes on the baking sheet and drizzle with the olive oil, gently turning and sliding and rubbing the tomatoes around in the oil to coat them on all sides. Sprinkle with the salt and, if desired, the sugar. 3. Bake for roughly 1 hour to 1 1/4 hours, until the tomatoes look a little wrinkled and sticky and are starting to brown on the bottoms but still have some moisture left in them. 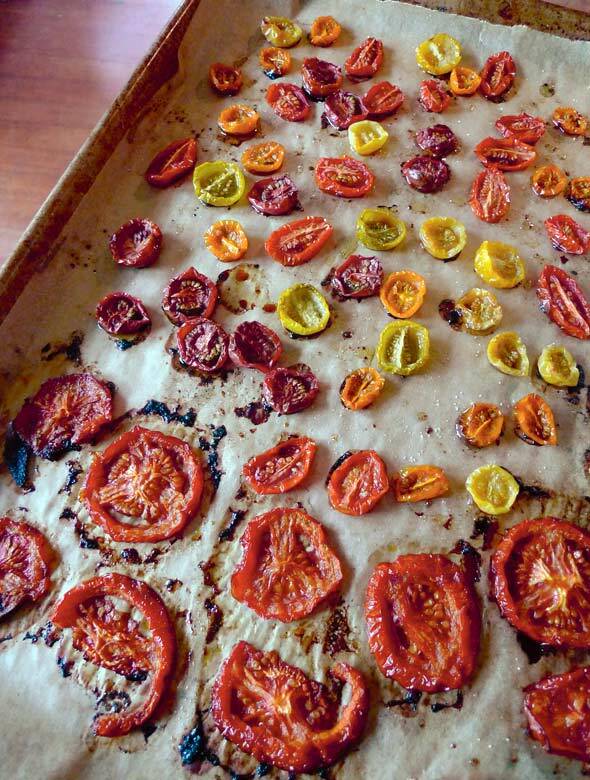 Remove the parchment and the tomatoes from the baking sheet and let cool on a wire rack while you try not to inhale all of them, one after another. Oven-Roasted Tomatoes Recipe © 2010 Jessica Theroux. Photo © 2010 Jessica Theroux. All rights reserved. All recipes and photos used with permission of the publisher. I love tomatoes in any shape or form, so this recipe got me particularly excited. In the past I’ve roasted tomatoes loads of times, though I never took the extra time (or used lower heat) to caramelize the tomatoes. This recipe worked great, although start checking your tomatoes around the 60-minute mark. I let mine go the full time and a few of them were a little dark. I’d also recommend rotating your sheet pan (I’ve got an uneven oven) halfway through roasting. The uses for these are limitless. I ate a few on their own and let me tell you, they are definitely sticky, chewy, and luscious in their tomatoey flavor. I used the remaining tomatoes in an awesome steak, farro, and blue cheese salad. The sticky tomatoes made the dish pop with bright notes of acidic chewiness. Next time I think I’m going to double the batch, pack the tomatoes into canning jars with olive oil, and use them whenever I get the desire. These are that good. Simple and delicious. And just three ingredients, without the sprinkle of sugar. It’s the beginning of tomato season, and I made the right decision. These Sticky Tomatoes needed no sugar enhancement to create a tasty sensation when eaten alone. I can also think of hundreds of possible delectable options to eat these alongside of: in a salad, as a garnish, tossed into hot pasta (or into a pasta salad), added to places where traditionally chopped tomatoes would be used (e.g., tabbouleh or a fritatta, where it was originally intended), with cottage cheese or yogurt, added to a grain (whether it’s rice, quinoa, or couscous), next to an appetizer tray of olives and cheeses, atop pizza or flatbread, in salsas…oh, the possibilities are lovely and quite endless! As a note for the future—for visual appeal, I’d love to try this with some of the multicolored and interestingly shaped heirloom tomatoes in the markets right now. Sticky, yes. In fact, “squidgy” was the word that came to mind when I was eating these luscious tomatoes, and I mean that in the most complimentary way. I’ve made oven-dried tomatoes before, but usually dry them out more than this recipe called for. And I found that I liked leaving some of the moisture in them. I balked a bit at the amount of salt and olive oil the recipe called for, but it turned out that neither was overpowering. I bumped up the recipe by 50% and we ate half as a side dish for dinner, drizzled with more olive oil and garnished with fresh basil leaves. I’ll use the other half tomorrow, probably in an omelet. Very easy and very delicious. I love the idea of taking the freshest produce of the season and slowly roasting it to bring out its depth of flavors. Making this type of recipe is so great—you can put it in the oven and not worry about it for over an hour and the result is a slightly sticky, slightly caramelized tomato treat! I used cherry tomatoes and even though they are in season, I did add a pinch of sugar in addition to the salt and oil. I recommend tossing the tomatoes with the oil, salt, and sugar in a bowl so you can give it a good stir to make sure each tomato gets coated. I’d like to try this again with those pretty, multicolored heirloom cherry tomatoes. We ate this as an appetizer on a toasted five-grain loaf of bread. I think it’d be a great topping for pork chops, fish, or even skirt steak. As an appetizer I bet this would be great as a topping for crostini with some ricotta cheese. Lots of possibilities with this recipe! These are yummy, no doubt about it. They were super simple to throw together, and I enjoyed the mix of cherry tomatoes and regular tomatoes. I used half red cherry and half yellow cherry, and threw in some heirlooms I had on hand. The crunchy caramel flavor on the browned bottoms was addictive. I can’t say that they really differed too much from any other slow-roasted tomato recipe I’ve made, but it was a good reminder to have these on hand regularly. They’re absolutely delicious. Although the recipe says that it serves 6 to 8, I ate most of them as a snack by myself! Delicious, healthy, and nonfattening. The tomatoes I used were luscious summer tomatoes so I didn’t use sugar—none needed. Mine were done in about 45 minutes. I served the remainder of the tomatoes as a side dish to lemon-pepper roasted chicken, although I should have doubled the recipe because there really wasn’t enough of them (of course not, after I had already snacked on at least half of them). In a word—yum! These were so tasty and effortless to put together. We grilled some multigrain bread and topped toasty slices with these roasted tomatoes as an appetizer. Everyone really enjoyed them. This is a great way to add more oomph to lackluster tomatoes. These are excellent on a sandwich in place of relish. I intend to bake them into muffins, too. Simple idea, easy to execute, top results. I really liked the way these came out. I used three salad tomatoes, since I didn’t have any cherry tomatoes. They were a little more moist than oven-dried tomatoes I’ve made in the past and also held their shape fairly well. Usually I dry tomatoes for a longer time at a lower temperature, but I liked the results of this method. Following the suggestion in the headnote, I used the tomato slices to top an herb frittata (tarragon, chives, parsley, and scallions). I’ll be doing that again. This roasted tomato recipe is useful to have in one’s arsenal. First, it’s easy to make. Second, the flavor is good, though it depends on the quality of the tomatoes. I chopped the ones that fell apart and put them in a tomato sauce. I toasted some leftover cooked pizza dough, created small bites of bread, put the tomatoes on top with a piece of basil, and then added mozzarella and lightly heated it, so it was like crostini. I roasted the mix of tomatoes for 1 hour and 15 minutes; they were wrinkled but didn’t appear brown on the bottoms, so I roasted them another 20 minutes. Mine still seemed more brown on the tops than the bottoms, but were well roasted. When cooled they were chewy. I tried these in a frittata, as the author suggested, with zucchini, mozzarella, onions, basil, and oregano, and it was wonderful. It makes a great substitute for sun-dried tomatoes and seems like it’ll be a tasty addition to many recipes. Even the title of the LC Note, Sticky Tomatoes, is enough to make you want to make them! I sliced the cherry tomatoes in half, drizzled with oil, seasoned them, and roasted them for 1 1/4 hours. At this point the tomatoes were starting to brown and curled around the edges but they were still a bit soft. The tomato flavor was pronounced and concentrated and actually tasted like tomatoes should. I loved the texture, too—they had just a bit of chew to them. They actually should be called Tomato Candy, as that’s how they tasted. Not sugary like candy but rather the caramelized flavor brought out their natural sweetness. Just wonderful. We used them with homemade pasta. I made another batch and used them in marinated feta cheese with fresh thyme and rosemary, lemon zest, coriander seed, and pink peppercorns covered with oil. They were divine with bread and crackers. They’d be great on mini skewers with chunks of goat cheese or feta and fresh basil. I just love these things and when we have tomatoes from the garden I plan to at least double this recipe to confit them. If I were to add something, it’d be some fresh thyme leaves before roasting. Other than that, they were nearly perfect for their flavor and versatility. I used cherry, grape, and some very small regular tomatoes. We aren't getting any fresh tomatoes from the garden yet, so I added sugar to the store tomatoes. The tomatoes were just okay, but the slow baking brings out some natural sweetness in the tomatoes, and with the additional sprinkle of sugar and the beginning of the browning on the bottoms, you end up with sticky, gooey tomato heaven! It's great on eggs, in eggs, on pasta, and as a side with chicken. We slathered this on French bread that was toasted on the grill. I'll be certain to make this for the July 4th party we're having. I think this is an essential technique that every cook should know, especially for when tomatoes aren't in season. The slow cooking really intensifies the sweetness of the tomatoes. I like to use them in salads, omelets, as crostini toppings, and as an addition to tomato soup. I don't think it's necessary to slice the tomatoes, so feel free to skip that if you're short on time or don't want to deal with the messy seeds. As soon as I read this recipe, I had to go compare it to one my own grandmother used to make. Indeed, it was very similar. The main difference is that she made a big deal about using high-quality extra-virgin olive oil and added a tad more salt. I decided to go with the extra-virgin olive oil but used the same amount of salt as this recipe. The tomatoes came out absolutely perfect, and though I'm sure they would have been amazing in a frittata or pasta dish, I actually found myself eating them by the spoonful. Assuming these aren’t inhaled at once, what is the best way to store them? I’ve kept oven-roasted tomatoes in olive oil in the fridge. But I’m curious what others do? Hey, gang….? Ditto, David. Olive oil and a glass jar–that’s it. I also freeze roasted tomatoes at the end of the summer, when I have an abundance of them in my garden. Great stuff to have in the winter for stews, etc. I’ve just tossed them into a container and stored them in the fridge. I can tell you they last at least 2 days that way… I’ve never had any left over longer than that. However, at the end of summer, when I’ve cleared the garden and have piles of tomatoes, I’ll do a marathon roasting session and freeze them in 1 cup portions to use throughout the year. Many thanks, Leanne. And yeah, two days sounds about as long as I could manage to keep some around in my kitchen, too…showing great restraint, I may add. How perfectly lovely! I’m certainly no Italian grandmother, but I can imagine dozens of ways to use these jewels from breakfast through lunch and right on to dinner. And in every course – lovely salads, gorgeous appetizers, and luscious mains as well. I just happen to have an abundant harvest of tomatoes this year and so I’ll be making my own sticky, chewy, squidgy treats very soon. Lana, I have trouble getting my fresh tomatoes anywhere but my mouth (impatience is a hungry beast), but I am as anxious to try this as you are! Imagining a perfect pasta, or a really special BLT. Love the BLT idea. Maybe an Italian themed BLT with these lovelies on ciabatta, some very good olive oil, pancetta, and mozzarella. Oh, and basil. Always basil! How beautiful would that be! mmm…have used this techniques for years when I have a tomato surplus! With smaller tomatoes, I just cut them in half. Adjust cooking time to get the proper texture: soft yet chewy. Really nice with Roma tomatoes. I usually do also sprinkle with a bit of fresh thyme from the garden. And for the purists who say “no sugar,” just try a pinch…it is amazing! YUM!!!!! I pack them in glass Weck jars, cover with olive oil and store in the fridge. I have have enough, and ration them, so they have lasted at least two months if kept properly covered with oil, maybe even longer. And if there is someone you REALLY love, what a beautiful and delicious gift! We’re big proponents of the pinch of sugar, too, Zally. And yes, as you say, sacrificed as a gift only for those whom you REALLY love! How do you freeze them? Hello Mrs. McCutcheon. I would let the tomatoes cool then freeze them on a sheet pan. Once frozen, you can remove them and place them in a freezer bag for storage. If they last that long, that is! Your so smart! I don’t know why I didn’t think of that! Should I add a bit of oil? Hi Chantel, I think I would add oil if refrigerating but keep individually frozen so they are easier to portion. In 2017 this recipe is still holding deliciously strong! That’s what I love to hear, Penny!